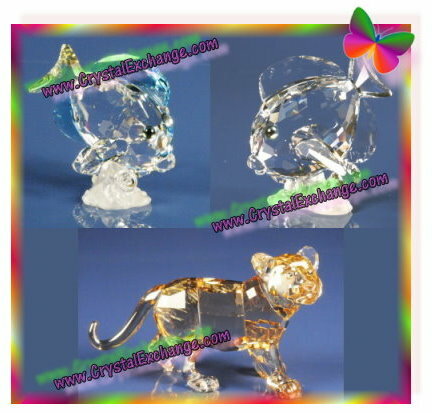 Some less commonly seen Swarovski crystal figurines are the frosted birds perched on top of clear thimbles. 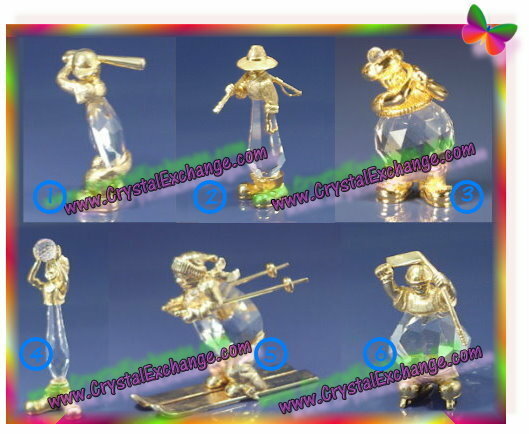 These figurines are better known as Swarovski Thimbles. The thimble bases are clear, but have different shapes, and are known under various names. One base is often referred to as the pinecone base or barrel base. It is difficult to describe, other than saying that is resembles a pinecone….smaller at the bottom and top, wider near the middle. The other base has a straight-line design, larger at the bottom and smaller at the top. This straighter design has also been called the panel-base. In the Swarovski thimbles photo, the Parrot and Toucan are shown on the pinecone/barrel base. The Owl, Eagle and Cockatoo are shown on the panel/straight base. 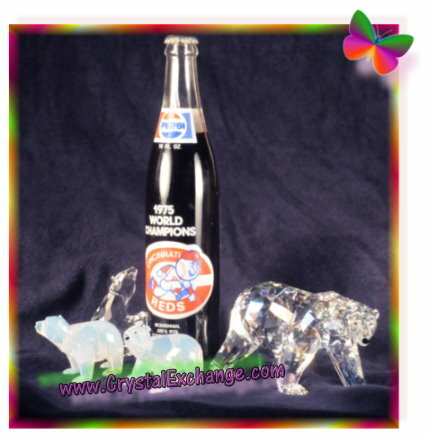 The Swarovski Thimbles were produced under the “Crystal Colors” name in the European market. The crystal thimbles were about 2.25” tall. While I am uncertain as to the approximate retail price while they were available in the 1990’s, they are estimated to be valued at $100 – $200 each on the secondary market. It is difficult to find the bird thimbles these days, but they are oftentimes sold as a set of 5 birds (with the same base) or a set of all 10. I generally confirm details for my articles using the well-respected Warner’s Blue Ribbon Books on Swarovski. While I was closing the Swarovski book, the pages flipped to the Zales Cockatoo on Stand figurine. I turned back to the thimbles pages. Back and forth to the Zales pages. Know what? I believe that the same frosted birds are used on the Zales figurines, which were produced in the 1980’s in USA for the Zales Jewelers stores! I have never heard this theory anywhere else and I don’t have any of the figurines for a visual comparison, so this may very well be a new discovery! Good luck finding the Swarovski birds crystal thimbles….finding them is becoming a real challenge! If I should obtain confirmation as to the question of the Swarovski bird components being used for both the thimbles and Zales figurines, an updated post will certainly be in order! In a recent press release from Cranston, Rhode Island, Swarovski Optik announces that their new CL Companion Binoculars have been selected as one of the “Best of the Best” for 2011 by Field & Stream Magazine on the new release . Given out annually, Field & Stream’s “Best of the Best” is awarded to the best new products in the hunting and shooting market, and is considered one of the industry’s top awards. I’m no binoculars expert, so I liked watching this YouTube video about them. The Companion CL Binoculars aren’t quite as pretty as the sparkly ones shown on the Swarovski crystal brand’s web site, but the award likely says it all. From what I could find on the internet, prices are: $999 for the 10×30 and $929 for the 8×30. This is terrific news for Swarovski! Congratulations on a well-developed new set of binoculars! The Swarovski Bald Eagle (Numbered Limited Edition in 2011) is a spectacular statuette by Heinz Tabertshofer . These Bald Eagle figurines have a unique number engraved on the crystal base, and a matching special Swarovski Certificate stating the edition number. The Swarovski Bald Eagle exceeds 11″ in height. Its accessories include gloves, brochure, and a locking blue storage case. 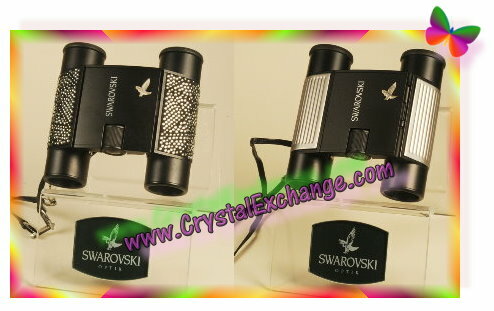 This crystal Bald Eagle is a Swarovski NLE, limited to 10,000 units. It was initially available to SCS members only, but beginning in July, 2011, any Swarovski collector can purchase it in a store or online at the Swarovski site. The Swarovski Bald Eagle has come with some criticism by Swarovski crystal fanatics. Many are not sure that they like the colored figurines. And some are quite skeptical since the last couple of NLEs were not near-immediate sell-outs, instead taking nearly a year to close out inventory (some speculate that they never sold out). At the MSRP of $3800, my opinion is that you should REALLY like it before making the purchase. If you are wanting to add the Swarovski Bald Eagle to your crystal collection, go to CrystalExchange.com and view the category Collector Society / SCS, then sub-category Annual and Limited Editions. The Bald Eagles on the Crystal Exchange America web site are priced under the MSRP of $3800. About a week ago, I discovered another limited edition Swarovski – Steiff Bear that will be on the shelves this fall. This limited edition teddy bear is the Swarovski Steiff Bear ‘Candy’. From the description I found, Swarovski Steiff Candy is a pale green mohair teddy bear. Also called the “Sparkle Teddy Bear”, Candy’s pendant necklace is the Swarovski Candy Cane ornament. Steiff Bear Candy is a Limited Edition Bear with a maximum production of 1500 units. The Steiff USA web site and some stores in North America are accepting pre-orders for this fuzzy teddy bear. The suggested retail price on the Steiff Swarovski Candy bear is $260. Steiff Sapphire – Limited Edition. Steiff Krystina – Limited Edition. 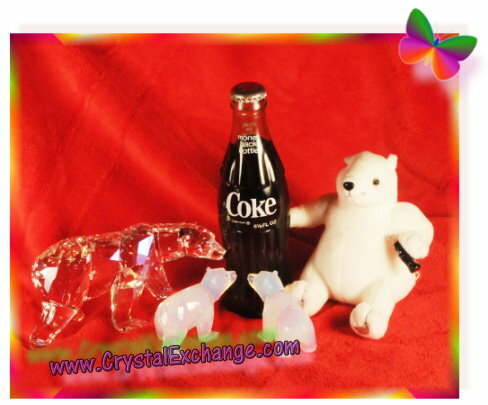 Check out the Crystal Exchange America web site www.CrystalExchange.com if you are interested to purchase any Swarovski Steiff Bear figurines that are retired. Simply use the search bar and type in “Steiff” for current availability and pricing! Today I received a product brochure from an authorized Swarovski retailer. Among the many offerings in it, I noticed the Swarovski Crystalline Ballpoint Pink Hope Pearl Pen for Breast Cancer Awareness. In the pen description, it states that a portion of the proceeds will benefit the Lilly Ross Breast Cancer Foundation. The Swarovski system number for this pen is 1079443 and the retail price is $30. It was originally launched in during Breast Cancer Awareness month (October), 2010. If you are interested to purchase the Swarovski Breast Cancer Awareness Pen, check out the Crystal Classics web site for availability on this pen. Our favorite crystal brand presently has 19 different Swarovski ballpoint pens available in the online shoppe. They also have 5 different Swarovski USB pen issues available. 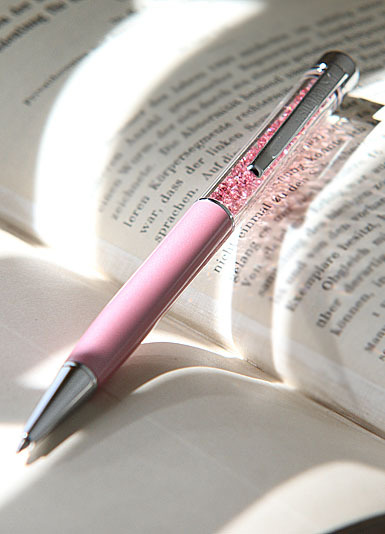 The Swarovski Pen collection can be viewed in the ‘Stationery’ category of Swarovski’s site.